This post is available for re-posting on MAKER blogs. Please contact us at aurorasaurus.info@gmail.com to let us know. This post will share with you a new educational Maker idea for a hands-on fun aurora demonstration… but first, the motivation. Over 300,000 people attended the 2016 USA Science and Engineering festival in Washington, D.C. in April! Many of those attendees were excited kids who were running around learning all about different areas of science from space to medicine with hands-on activities. Aurorasaurus attends many of these festivals to talk about our project and the science behind the aurora. We’ve brainstormed a new hands-on activity to share with kids and adults at any festival or public engagement event that we hope you’ll create, share, and enjoy! Here’s our DIY project of how to simulate an aurora with LED lights! Get a Plinko-type box, such as a Galton box or quincunx. Add pegs in a pyramid shape formation so there’s more pegs at the bottom and fewer at the top. At the top of the Plinko box, drop a small ball. As the ball falls, it will hit the pegs– similar to a ball traveling down a pinball machine. Each peg has an LED light of various colors attached to it. When the ball hits a peg, the LED light will light up. 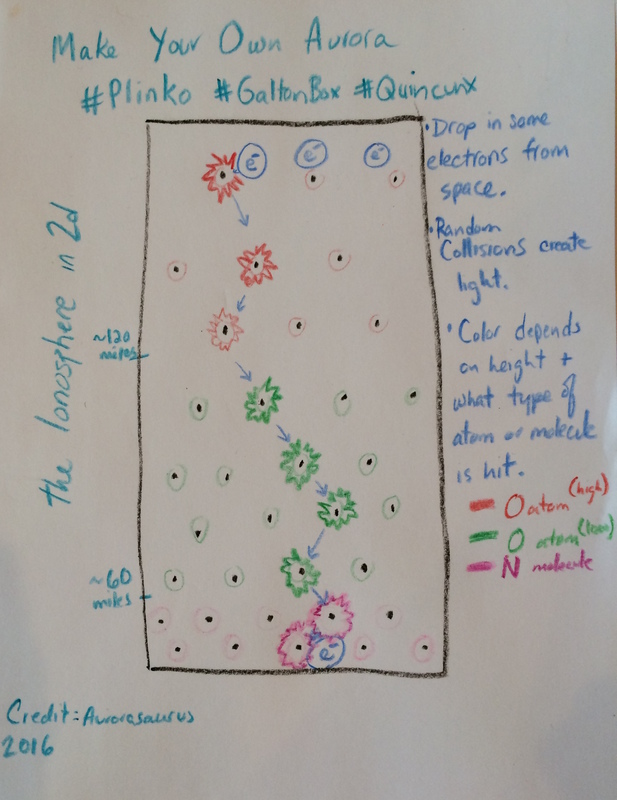 The entire activity demonstrates how electrons from space (the ball) interacts with ions (the pegs) in Earth’s ionosphere (the Plinko backboard). Red LED lights represent oxygen and should be placed on pegs higher on the backboard, as they are found at higher altitudes in the ionosphere. Green LED pegs represent oxygen and should be placed in the middle of the backboard, as they are found at middle altitudes in the ionosphere. Pink LED pegs represent nitrogen and should be placed near the bottom, as they are found at lower altitudes in the ionosphere. Participants can grab electrons (the balls) and drop them at any height to create different light patterns. This activity is not completely accurate (explain what this activity fails to show), but is a good demonstration of how electrons collide with charged particles in air in Earth’s upper atmosphere. We’d love to see you make your own aurora and share pictures of your final product with us along with construction tips! 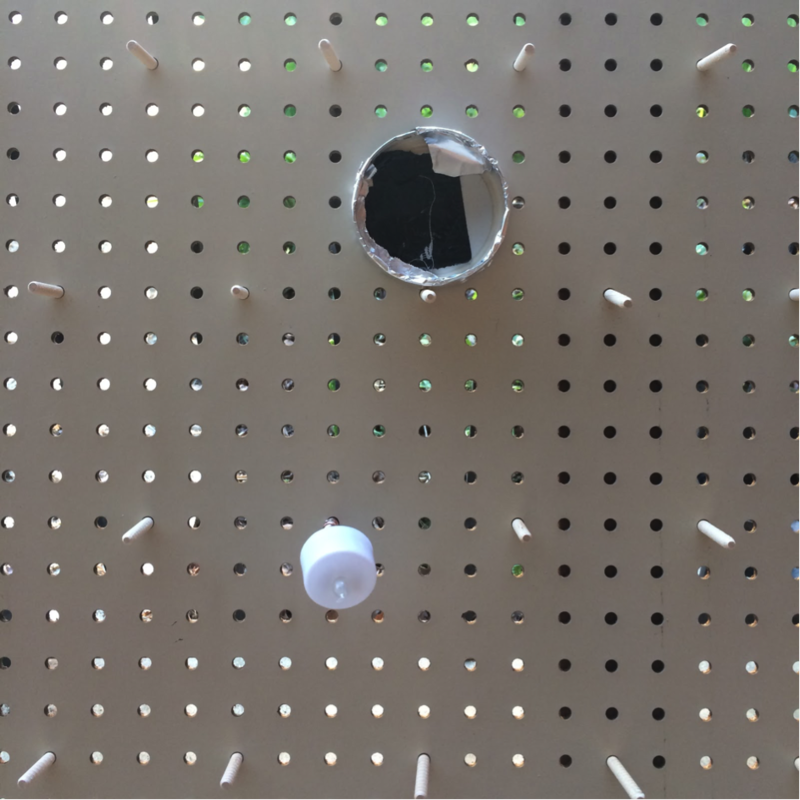 Materials needed: a PLINKO board with some old peg board ($2 at a used hardware store), pegs, an LED electronics kit (<$1/light), metal disks (we used lids of a can or glass jar). Make your PLINKO board. Fortunately there are great DIY Plinko instructions here. Arrange the pegs at various levels on the Plinko board. Remember, red LED lights represent oxygen and should be placed on pegs higher on the backboard. Green LED pegs represent oxygen and should be placed in the middle of the backboard. Pink LED pegs represent nitrogen and should be placed near the bottom. Wire the pegs so when they are hit the light turns on. The disks (electrons) would need to be metal, can lids might work well (free). Metal pegs could be used or some kind of wooden dowel with metal tape on it. Altering dollar store LED tea lights might be the best way. 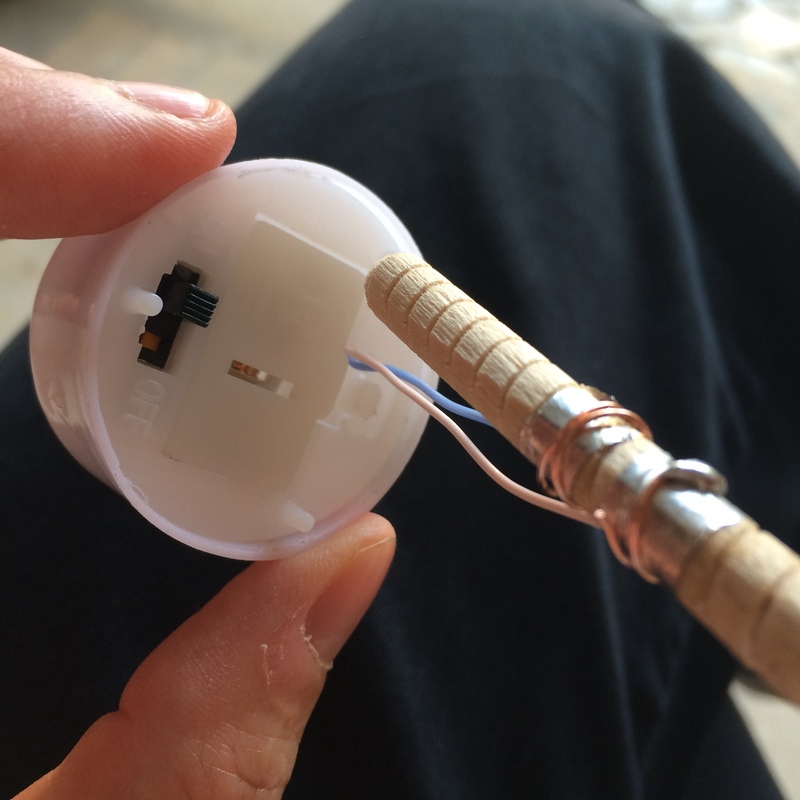 ** Metal tape could be added to increase the conductivity on the pegs or the disks. Much more fancy circuits could be used too. *** Here’s a few pics to illustrate one way to do this. * A variation for software gamers is to make your own virtual electronic version of this – that would be super cool too. *** A second variation would be to wire the pegs together and run the circuit from a Raspberry Pi or Arduino as opposed to each light being its own circuit. Closeup of the front of the LED with the circuit closed by impact from the can lid. This is a hack job but actually worked in practice. We’ve only wired one so far. A pegboard with wooden dowels, an LED tea light, and a can lid (weighted with pennies covered by black duct tape and wrapped with foil). Note construction can be much improved. Closeup of the back of the tea light wired to the dowel. We popped off the cover of the tea light, clipped one wire and soldered two more on, connecting them to metal wrapped pieces of the dowel. The circuit is open here. Note, this is a crude set up. 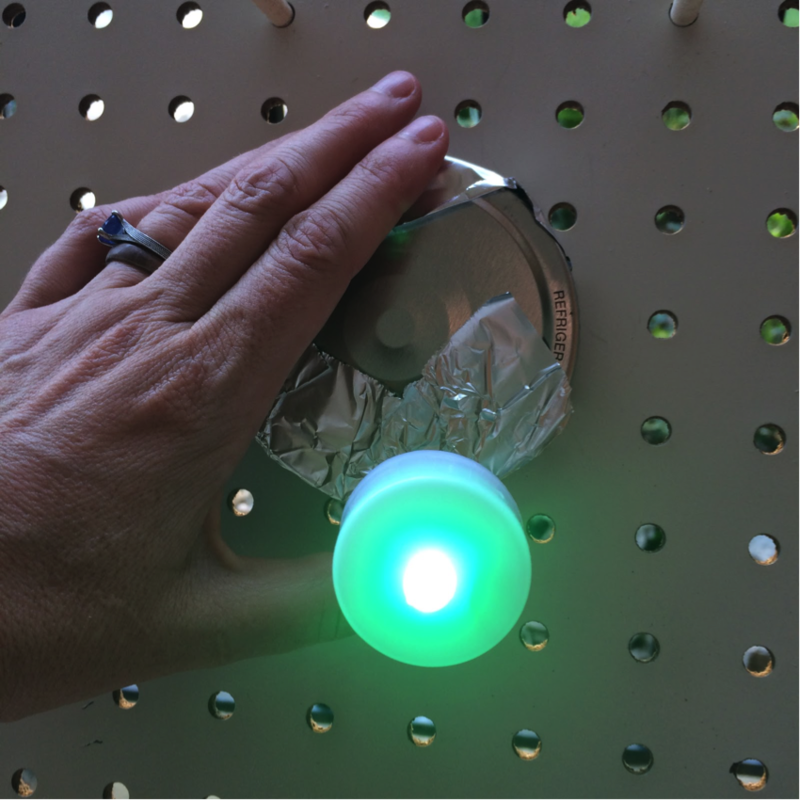 This entry was posted in Education and tagged DIY, Maker. Bookmark the permalink. ← It’s a bird, it’s a plane — no, it’s a sprite!